BLACK DRAGON AIKI-JITSU: "Capabilities of the Hard & Soft", is an "Art of Self Defense" and a "System" of Self Protection". "BLACK DRAGON AIKIJITSU" was founded in 1971 by Grandmaster Ron Van Clief, 10th Dan. The Ju Jutsu roots, from which Aikijitsu is well documented and can be traced to its roots before the 1870s, as coming from ancient forms of Japanese samurai warfare and self defense arts and have been further developed in the United States of America in the mid 1940's after World War II. 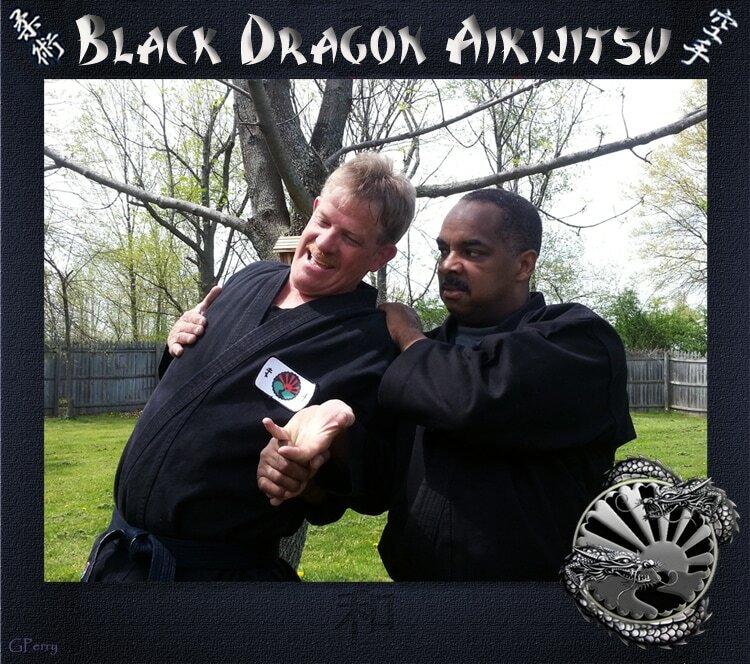 The principals of Black Dragon Aikijitsu have been developed over the years by Grandmaster Ron Van Clief as a reconstruction and synthesis of several martial arts concepts based on the founder's experience. Black Dragon Aikijitsu is a combination of three primary arts, "Aiki", which is a comprehensive blending of the self with an attacker, the forms of Ju-Jutsu as taught before before the 1870s, the hard and soft features of Karate-Jutsu. These three Arts, along with the philosophical teachings of "ZEN-DO", which are important principles and concepts of martial arts as a 'Way Of Life'! The principals of Black Dragon Aikijitsu represents several concepts, or ways of applying coordinated techniques by using any part of the body as a tool or weapon in armed and unarmed combat. It can be said that Black Dragon Aikijitsu teaches functional processes and practical methods of self defense that enable one to calmly face an attacker and move on without hesitation. Face an opponent as to avoid, diffuse, immobilize, punish or reasonably destroy an attacker in an instant. Practitioners acquire long-term proficiency of coordinated striking techniques of Karate along with the applied knowledge of the Ju-Jutsu techniques of distracting impact strikes with arm-bars, joint locks, dislocations, muscle twisting, strangulation and body projection throws one always has a comprehensive arsenal of self defense possibilities at their command. Another characteristic of Black Dragon Aikijitsu techniques is that they may be offensive and defensive depending upon intention and who initiates the first technique. Again, this produces psychological advantage because any technique one has learned well can be adapted to fit any situation. There is no need to try to remember what technique was for what situation... they can all fit any situation. It is for this reason that techniques are practiced from all sides and all angles--it allows the jujutsuka to learn flexibility of mind and adaptability to change. Black Dragon Aikijitsu is also learning about "STAYING OUT OF HARMS WAY" through intention, motion and movements; not only the strengths but also the weaknesses. Every motion, every movement has a weakness that can be exploited, whether it is an offensive or defensive motion, and for this reason, when the jujutsu-ka moves, he must not only be aware of his attacker's motion so that he can execute the proper techniques in response,he must also be aware of the weaknesses in his own motions so that he can defend them. All of the motions are (or should be) performed to insure that he can regain his posture before the attacker can regain his. The techniques and motions must be performed smoothly with attention given to proper balance and timing. These are perhaps the two most significant principles of Black Dragon Aikijitsu, or any other martial art, for that matter. Without balance there is nothing. You cannot attack, defend or move without balance. And without timing, your movements will be wasted and ineffectual, your techniques clumsy and your chances slim. It takes balance and timing to make the graceful, smooth, and quick purposeful transitions from one technique to the other, and this is important. It is not always the person with the greatest number of techniques that will emerge victorious from an encounter, but the one with the best command of the techniques known to him. No matter how fast a person appears to move, the movements must be timed and coordinated with the movements of an adversary. Each encounter is determined by the one who uses their techniques best, thus having the greatest chance of making it safely home. Both Ju-Jutsu and Karate consist of an array of armed and unarmed combat techniques. As the two schools have evolved however, Ju-Jutsu focused primarily on the Samurai arts. A fusion or combination of these two schools of thought help make Black Dragon Aikijitsu is a comprehensive self-defense system, focusing on soft-circular blocks, strikes, low kicks and the Ju-Jutsu techniques producing acute pain and confusion through the use of pressure points, grappling, arm bars, joint locks, strangulation and body throws. Shidoshi Glenn Perry has been studying martial arts for 50 years and is a first generation, direct disciple of Grandmaster Ron Van Clief for close to 45 years. Mr. Perry believes that "Change Is Constant" and that our arts evolve with us as we mature in life. The Black Dragon Aikijitsu System being taught today is a interpretation of what was taught to Grandmaster Glenn Perry and his understanding of this beautiful Art! The warriors of old lived on the very edge of life and death with trained martial spirit everyday. Although they passed down to us "A Way to Live Life to the Fullest", today we have found that it is, ultimately, about living HEALTHY and SMART! The key is to the "Living Each Day Fully". This is also the way of Bushido!